The time has come to retire the swaddle folks. Here, use my tissue to wipe your tear. It was inevitable. The days crept upon us, slowly at first and then all at once like a racehorse. We’d find a hand would wiggle free and then suddenly his whole leg exploded out. Rory seems to be speeding through milestones and last night he decided that he was done with the swaddle. Don’t get me wrong lady, I’m excited to see him grow, but part of me will miss this baby stage. Being a second time parent is easier in this regard. We’ve got experience on our side and we know that the sleepless nights do end. It’s easier to appreciate the rough times when you know the giggles that lie ahead. Immediately after removing the swaddle, Rory flipped over onto his stomach; superman style. 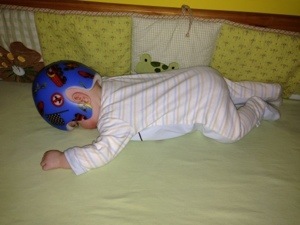 Since he is back to wearing his helmet full time, he can rest his head, face down on the mattress. Listen lady, it looks like he just took a major face plant; but the helmet provides just enough leeway that he can still breath and mommy can have an anxiety attack over whether he is breathing.